WITI Women Speak Out: National Conference Launches with WITI/IDC Survey "Making Technology Work for Women"
What better way to launch WITI's National Conference, "Taking the Lead in the Digital Age," in Los Angeles on May 5, 2005, than to ask women what they think of the technology they buy and use? Here are the top line results of our survey (your survey), conducted in partnership with IDC. More than 2400 of you took the time to tell us what you thought. The survey results challenge the stereotypes about women and technology, revealing that women are early adopters and are pushing the boundaries of what can be achieved through technology products in the United States and worldwide. WITI is gearing up for the December Conference in Silicon Valley! Email [email protected] or call (800) 334-9484 for more information on how to get involved. Why Not Tell The Truth? Communication is the vehicle by which we create and maintain all of our human relationships, and if we "speak the truth" when we talk or write to others, then these relationships can be deep and honest. But there are many reasons why we may not always chose to tell the truth in a given situation. Let's take a look at these reasons and what they cost us, and then explore some ways to tell the truth more easily and consistently. Research indicates that women are underrepresented at the executive levels of information technology (IT) organizations, holding only 5.1% of those positions. Is this a negative or a positive for women who have already obtained executive status or for those who are pursuing it? Some executive women believe that being a minority in the executive ranks of the IT industry has only helped them stand out among their male peers. They have acknowledged the reality of the current situation and have found a great opportunity to turn a negative into a positive. These women use their underrepresented status as a competitive advantage for themselves. They enjoy being in the minority with regard to gender, as they tend to stand out more at meetings and are more likely to be remembered. Discuss this article! Dr. Page, as a WITI Member, submitted this article to WITI for publication. Do you have expertise to share? WITI gladly accepts submissions for publication! For more information or to make a submission, please visit the Members' Area. Janice Knight, a seasoned coach and senior HR professional, writes: "I just completed a fabulous, intensive, 6 day training program to become a certified Group Leader for Marcia Weider's Dream Coaching Program. There is real power in aligning with others on your journey, and participating in the Dream Coach Program is an affordable and powerful way to discover and launch long lost dreams." Janice is now ready to help others pursue and achieve their own dreams. If you are ready to join fellow Dreamers on a fabulous voyage of self discovery and creation, Email Janet at [email protected]. 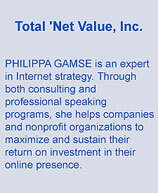 Featured Business: Total 'Net Value, Inc.
PHILIPPA GAMSE is an expert in Internet strategy. Through both consulting and professional speaking programs, she helps companies and nonprofit organizations to maximize and sustain their return on investment in their online presence. She is a Certified Management Consultant, a designation earned by less than one percent of professionals. Her clients come from a wide range of industries and non-profits in both North America and Europe, including Princess Cruises, Harley-Davidson Motor Company, Prudential Real Estate Affiliates, Reed Exhibitions, the International Association for Exhibition Management, and the Produce Marketing Association. Her proven track record of innovative thinking has led to key improvements in the online enterprises of her clients, who report significantly increased levels and quality of leads, sales and customer relationships. Authors Margaret Heffernan (The Naked Truth: A Working Woman's Manifesto about Business and What Really Matters) and Mary Lou Quinlan (Time Off for Good Behavior: How Hardworking Women Can Take a Break and Change Their Lives) will bring their provocative views and firsthand experiences on the real world of work as women live it to WITI Chicago. They will share how women can survive, succeed - and be happy - in the non-stop careers of their lifetimes. Don't miss this special event Wednesday, May 25, 2005, from 6:00 - 8:30 PM, at The Northern Trust Oak Street Financial Center in Chicago. Register today at http://www.witi.com/chicago/meeting.php?id=1830. Streaming Media East 2005is THE event for leading minds in streaming and digital media solutions! Coming off of a successful Streaming Media West show in October 2004, Streaming Media East 2005 is shaping up to be even bigger than last year. The conference will feature a busy exhibition hall, keynotes from CitiGroup and U.S. State Department executives, and high-level networking opportunities. Streaming Media East is a must-attend event for anyone involved in IT, streaming, or digital media solutions. WITI members: see the Discounts page in the Members' Area for information on how to save $200 on registration. Accenture is the world's leading management consulting, technology services and outsourcing company. We bring together the unique experiences and perspectives of a diverse workforce to deliver cutting-edge technologies and solutions to companies around the world to help them become high-performance businesses. That means we help them find ways to become more successful in every part of business, from strategic planning to day-to-day operations, making them more competitive in their market. Process Engineer -- GOJO Industries, Inc.
Primary Responsibilities/Accountabilities for this position include engineering support for projects relating to new and/or revised products and processes for commercialization; maintaining current production capacity and improving existing systems' performance, quality, and cost; serving as the primary resource for documentation, protocols, and implementation of validation for OTC products; optimizing cost, quality, performance of current products and processes; working on simultaneous projects. Applicants must be able to "switch gears," providing rapid response and flexibility to changes in project scope and direction. Joan Bader, Managing Director CSFB - Career Track..."How women can reach what they want and see no boundaries".